Accueil Produits Bande originale La bande originale de “Graine de star”. La bande originale de “Graine de star”. Sortie : 6 juillet 1993. Film : Graine de star. 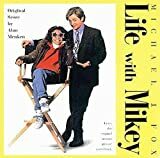 Life With Mikey – 0:50. At the Office – 1:02. Michael’s School Story – 1:24. Cold Enough to Snow – 1:32. A Black Eye – 0:52. Hark, the Herald Angels Sing – 0:39. Life With Mikey – 0:54. Silent Night (Betty) – 0:48. Christmas in Elmira – 1:25. Lullaby of Broadway – 1:12. Cold Enough to Snow (Titles) (par Jennifer Warnes) – 2:41.